With an oral examination and x-rays of the mouth, Dr. Omoto can evaluate the position of the wisdom teeth and predict if there are present or future potential problems. Studies have shown that early evaluation and treatment result in a superior outcome for the patient. Patients are generally first evaluated in the mid-teenage years by their dentist, orthodontist, or by an oral and maxillofacial surgeon. 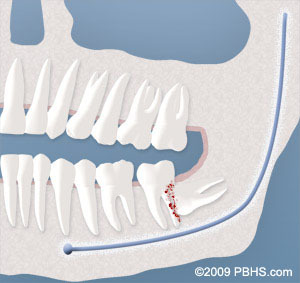 A very common clinical problem is pericoronitis, (a localized gum infection). The gum tissue around the wisdom teeth can become irritated and infected, resulting in recurrent pain, swelling and problems with chewing and swallowing. 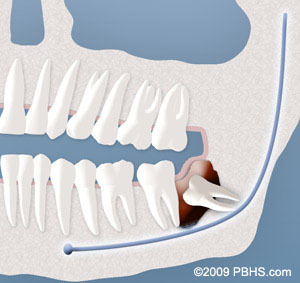 Impacted wisdom teeth may contribute to unfavorable movement of your teeth. Non-infectious disorders may also arise in association with impacted wisdom teeth. Cysts may develop inside the jaw bones and slowly expand destroying adjacent bone and occasionally teeth. Although rare, tumors can also be associated with impacted wisdom teeth. The fee for your treatment is determined by a number of factors. These may include the difficulty involved in removing your teeth and which type of anesthesia is best for you. The surgeon will review your x-rays, complete an examination and determine the best option for anesthesia during your consultation appointment . This will allow us to provide a cost estimate. Every insurance company has a different policy regarding the extent of coverage for a given surgical procedure. Our financial coordinator will assist you with your insurance company and all financial arrangements. At the time of your consultation, your specific situation will be discussed in detail. We encourage you to ask all questions you may have. If new questions arise after your consultation, please call our office at Torrance Office Phone Number 310-325-7800.